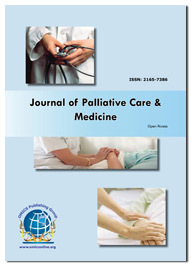 Palliative Care-2017 marked with the attendance of Organizing Committee Members, Palliative Care experts, Physicians, Surgeons, Nurses, Physical therapists, Occupational therapists, Academic researchers, Business delegates and Talented student communities representing more than 20 countries, who made this conference fruitful and productive. Conferenceseries LLC acknowledge the support of below Chairs and Co-chairs for whom we were able to run smoothly the scientific sessions includes: Dr M Sara Rosenthal, University of Kentucky, USA; Joanne Reid, Queen’s University Belfast, Ireland; Jerome H Check, Cooper Medical School of Rowan University, USA; Christine Kennedy, Philadelphia University, USA . Conferenceseries LLC has taken the privilege of felicitating Palliative Care-2017 Organizing Committee Members and Keynote Speakers who supported for the success of this event. With the enormous feedback from the participants and supporters of 3rd International Conference on Palliative Care and Hospice Nursing, Conferenceseries LLC is glad to announce its 4th International Conference on Palliative Care and Hospice Nursing from August 27- 28, Boston, USA.